It is late at night here, but I wanted to share this on the winter solstice! The past week or so has been rough on me mentally. I’ve had way too many weepy days where I would cry for seemingly no good reason. Several times I had anxiety/frustration meltdowns. You could argue about whether they were “autistic meltdowns” or “bipolar meltdowns”, but at the end of the day, does the label really matter? What matters is the suffering and finding a way to get through it. I’ve been upset partially because I feel misunderstood by everyone, including my therapist. Mental health professionals in my experience are generally kind, caring people who truly try to understand, but I think some things can’t truly be understood unless experienced personally. Unless someone has experienced the same level of trauma throughout their childhood and adulthood, been blessed and cursed with Asperger’s and Bipolar, been dealt the same personality and experiences, and developed the same chronic physical conditions, they probably can’t relate exactly to my plight….anymore than I can relate exactly to theirs. In the end it often feels like we are all fundamentally alone in our experience of the world, even though we desperately want to feel connected and understood. Fortunately, we can connect with others through some aspects of our experience, so perhaps that is what needs to be focused on. It is easy to feel completely separate and different from everyone else. At a base level, it is true for all of us, but that doesn’t mean we should quit trying to reach out. And so, I continue to write and seek out common ground with others, both online and in person. Quite frankly, I’m not sure what else to do. I saw my therapist this past weekend and it went ok, but I honestly think sometimes my therapist gets kind of annoyed or frustrated with me. I feel like she sometimes wants to see more progress than I’ve made, especially in the self-esteem/self-loathing area. To be fair, I haven’t always been the best about following up on actual practices to feel better about myself. I have done affirmations and things like that in the past, but I always end up kind of feeling ridiculous and giving up pretty soon when I don’t see immediate results…even though I know that immediate results aren’t likely. Many people look up to me and recognize my worth; I am admired. Most of these spoke to me because they were just simple and straightforward, or because they address issues I deal with constantly (like health issues or past trauma). #5 may seem a bit conceited at first glance, but I think it is important for those of us who feel really bad about ourselves to realize that others don’t share that negative view. If any of these affirmations speak to you like they did to me, feel free to use them for yourself! 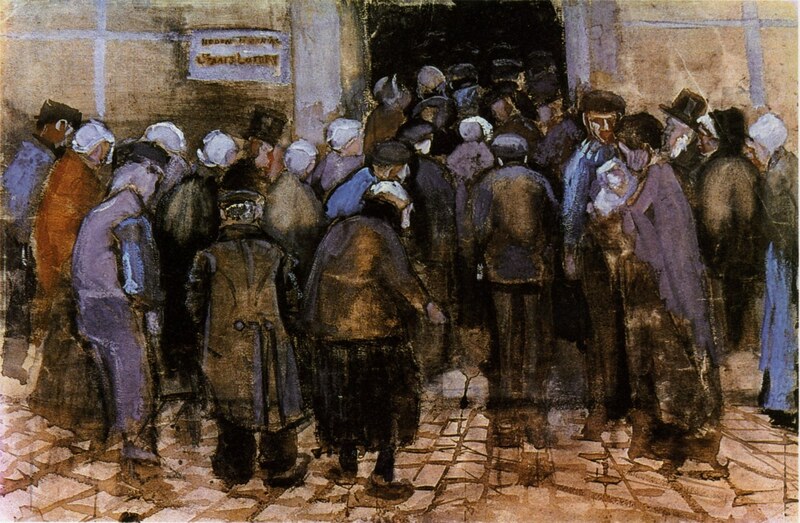 “The State Lottery Office (The Poor and Money)” watercolor painting by Vincent Van Gogh. On social media and in real life, I hear a lot about how the poor “take advantage” of the system and how they “waste what they have” or are “just plain lazy”. Of course, these comments always seem to come from people who are at least close to middle class and have never once gone truly hungry, been homeless or lost everything they have through some cruel twist of fate. Having grown up in a mostly one-parent family that did accept government and charity assistance on occasion (even though my mother often worked MORE than full time), I see a different perspective. I will admit that sometimes the things that the impoverished do may indeed contribute to their own problems, but often this is through ignorance or desperation. Often they make rash decisions based on immediate needs and not long-range goals…but that is because they are worried about survival right now and fighting for survival tends to occupy all your attention. When every day of your life is spent wondering how you will eat and find or keep shelter, there is not much energy left for self-help philosophies or economical posturing. Glimmers of hope might break through here or there (a better job, higher education, etc. ), but often these desires are washed aside by the necessity of making it through this month, this week or even this day. I will admit though that on occasion the impoverished may seem to purposefully waste money. Buying a lottery ticket, cigarettes, alcohol or junk food may seem like a huge waste when someone is down to their last dollar. So why do they do it? I think it is like Vincent Van Gogh once observed, they are attempting to “revolt against the misery” of poverty. They are laughing in the face of danger and saying that this miserable world isn’t going to steal every bit of enjoyment from them. It is not really wise, but it is an emotional reaction to a life that often seems to have no hope or end. Perhaps it is for the same reason that so many employees (even those in low paying management positions) steal from the big, impersonal corporations they serve, even if all they take home is a box of ball point pens or a few rolls of toilet paper. I’m not saying stealing is right, but in the human mind, there is always the desire for the underdog to score a triumph (even a tiny one) over who they see as the big bully on the block. All of these seemingly poor decisions are really just a way for those who feel ignored and despised to give this unfair, greedy world the middle finger. A way to quietly rebel, even if no one notices.